Las Fallas Fiesta is known for its lights, gunpowder, traditional costumes, fireworks or music, so visiting Las Fallas and Valencia in middle March is a great travel tip. 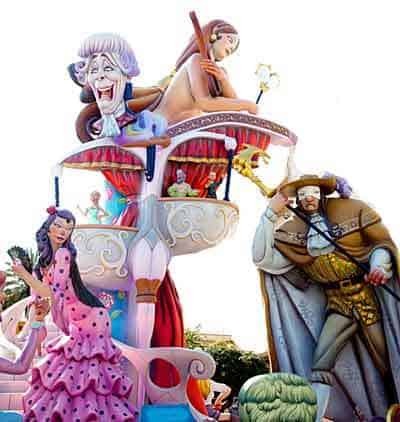 Las Fallas takes place every year on the dates 15 – 19 March. Nestled in the heart of the Mediterranean coast, the city of Valencia each year celebrates the arriving of spring with spectacular program. 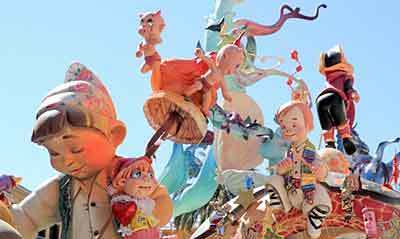 It’s a combination of fiesta, fireworks, quality satire shows – all together placed under the one name – Las Fallas. Every single street in the city center is showcasing colorful giant paper figures, known as ninots, very often several meters tall, placed at the end of the parade in fantasy groups – made to make fun with political figures or soap stars, for example. Every day at 2pm, there’s a “la Mascleta” – the concert of gunpowder with simultaneously exploding of hundreds of masclets. For those who love charming ceremonies, on March 17 and 18 there is the event that honors Valencia’s patron Virgin when thousands of “Falleras” come to the city center in traditional costumes. This festival dates back to the time when carpenters cleared their workshops throwing out an old wood at the end of winter, and over the centuries – it grew into the series of events that placed Valencia on the map of most interesting events, festivals and carnivals in March in Europe. The roots are in pagan cleansing rituals, heralding spring and a new start. There’s something spectacular about seeing these huge paper-and-wood figures reduced to ash. What is suggested not to miss, if visiting Valencia during Las Fallas, is definitely a spectacular firework that is usually displayed in the Paseo de la Alameda on March 19 and the moment when all Fallas burn all over the city in a spectacle of fire. 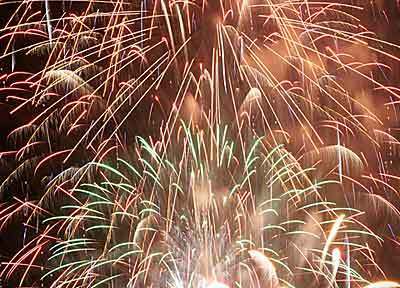 As the floral parades end around midnight, the Nit de Foc begins, with a formal hour-long firework display. It starts with a spectacular show, but this is the night that can become a real free-for-all, as the fearless (or perhaps plain stupid) start up reckless firework wars. You might prefer to be safely tucked up during this Guerra de Los Petardos – and you’ll probably need those earplugs if you want a wink of sleep. The important thing to add is that this carnival is not lasting only for mentioned few days; it is a series of events that run throughout March each year and it all starts on March 1 with Mascleta at the Plaza del Ayuntemiento at 2pm. It all finishes on March 19, with a program that lasts from 11am to 1am – March 20. Young visitors might find the main events scary, although little Valencian locals come muffled up against stray sparks. The best sights for youngsters are their very own ninot figurines. These go on show for a few days at a central shopping mall, before they’re set up on street corners. The burning of all the ninots happens on huge bonfires at the Town Hall Square, with a special early evening bonfire for the children. There are official warnings for pregnant women, and for anyone with a weak heart. You really could end up playing with fire, and you might want to pack your earplugs. 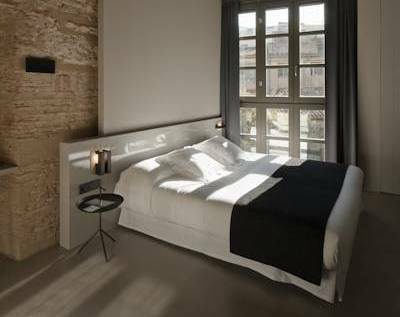 If you’re for a unique experience, definitely book a room in the Caro Hotel – 19th century palace, situated in the center of Valencia, only a few dozens of meters from the city’s Cathedral. Caro is a great mix of modern design with historical heritage, designed by Francesc Rifé. Rooms come with flat screen TVs, a free minibar and bathrooms with Bvlgari toiletries. The restaurant serves Mediterranean food with a modern twist and what’s the best about the Caro Hotel is its position – it’s in the middle of things to see in the center of the city. Some parts of this unique hotel are 2000 years old. Start choosing where to stay some period ahead if you can – the best rooms sell out fast. There are options here from budget to boundless extravagance, but most prices double for Las Fallas, whether you choose a humble hostel or a five-star treat.